If Gary Barnett can’t score a big loan at very favorable terms, is there hope for anyone in New York? For the fourth time, Extell Development, one of the city’s foremost developers, announced that the closing of a crucial mezzanine loan for three projects from fellow developer RXR Realty would be delayed. As part of the negotiations, RXR reduced the size of the mezzanine financing it pledged by $163 million. Extell securing the mezzanine loan hinges on it closing on a senior construction loan for One Manhattan Square, which The Real Deal reported in late July should be mere weeks from happening. Barnett is currently negotiating with a consortium led by Deutsche Bank and AIG for that loan, which was first reported as being $600 million. On Tuesday, the developer revealed to bondholders in Israel that it was close to finalizing that senior loan for $550 million. In March, RXR agreed to provide $463 million in mezzanine financing for the 80-story Lower East Side condo tower One Manhattan Square as well as Extell’s projects at 500 East 14th Street in the East Village and 555 10th Avenue in Chelsea. Things changed on Tuesday. Barnett reported to the Tel Aviv Stock Exchange that RXR has decided to divide the theoretical financing into two stages. Under these new terms, RXR would lend an initial amount of $300 million and reserve the right to provide the remaining $163 million. 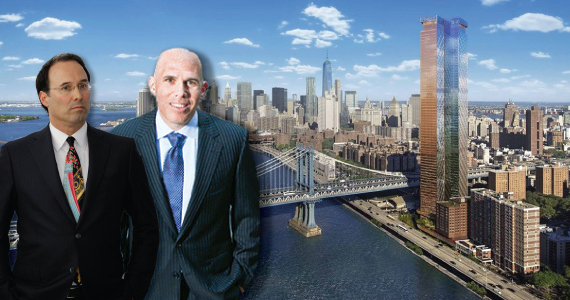 RXR, headed by Scott Rechler, also increased the loan’s interest by 1 percent to 8 percent. “RXR’s decision is creating a bigger hole for Extell, but it also reduces Extell’s total exposure,” Ori Eisenberg of real estate financial advisory firm One Ha’am told TRD. TheMarker and Israeli daily newspaper Calcalist reported first on Extell’s announcement. Following the announcement, TheMarker reported that bondholders were unhappy and disappointed. 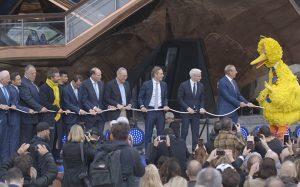 The bondholders held an urgent meeting Monday night to clarify the financing situation. Monday marked the fourth delay in the RXR loan closing: to June 30, then to July 31, then to Aug. 15 and now to Aug. 31. Barnett did not return requests for comment Tuesday. The total budget for One Manhattan Square, the 80-story, 815-unit condo tower at 252 South Street, is roughly $1.4 billion. In terms of existing funds, the project has $200 million in equity and $150 million in debt from M&T Bank. As of market close Friday, Extell’s bonds on the Tel Aviv Stock Exchange were trading at a yield of 11.8 percent, sources said. Meanwhile, at another Extell project, Central Park Tower, Barnett has a May 24 deadline to score a construction loan as part of his new partnership with Chinese developer SMI USA. If he fails to do so, SMI can force him to buy back its $300 million stake. And if he can’t do that, SMI can push him to sell the full project. Does Extell's new incentive at One Manhattan Square top them all?